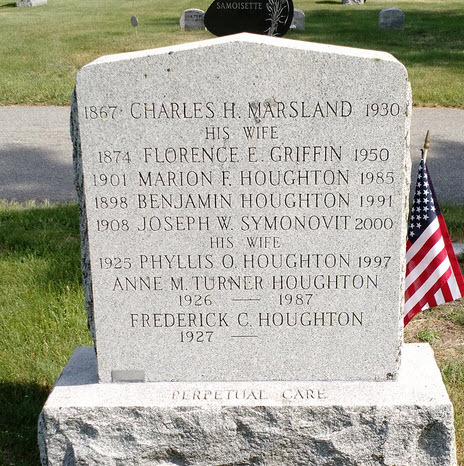 Maryette Morton married Hiram Houghton in Jul 4, 1847 at East Windsor, CT, USA. (?) Dodge married Ellen May Houghton, daughter of Daniel Goldsmith Houghton and Mary Alice Reed. William Kimball married Lucy Maria Goldsmith in Oct 27, 1869. Martha Houghton married Charles Morss. Charles Morss married Martha Houghton. Elizabeth M. (?) married Frederick Houghton Jr, son of Frederick Houghton and Sarah J. (?). Ruth E. Houghton married Edwin J. Meek. Ruth E. Houghton married Paul Gerrish. Ruth E. Houghton married Edward Hammond. Maud R. Dusenbury married Frederic Delmont Houghton, son of Lewis T. Houghton and Lillian Jennie Bachelder, in circa 1903 age 30 and 23; mar 7 y in 1910 census. Frederick Houghton married Sarah J. (?) in circa 1887 age 21 and 21. Sarah J. (?) married Frederick Houghton in circa 1887 age 21 and 21. Rev. Alexander Houghton married Anna Christina Saxild in circa 1921 age 26 and 28. Benjamin Houghton married Marion F. Marsland in circa 1921 he 22, she 19. Duplicate Ann is not in 1920 census; Frederica is. George Houghton married Agnes Mclellan in circa 1890 mar 20 y in 1910 census. Agnes Mclellan married George Houghton in circa 1890 mar 20 y in 1910 census. George Houghton married Ada Howard in circa 1911 age 22 and 18. Ada Howard married George Houghton, son of Henry Houghton and Sarah A. (? ), in circa 1911 age 22 and 18. Winifred Mooney married George Augusta Houghton, son of Josiah Stearns Houghton and Bertha Francis Belcher, in Apr 29, 1912 at Fitchburg, MA, USA, age 25 and 20. Hazel E. Houghton married (?) Gray.